Blast from the Past - Art of the Noughties For Your Wall! Since the turn of the century, art has taken an incredible variety of forms. Galleries stopped being the preserve of an elite, artists started communicating directly to the public, which became co-opted as a venue for artistic interventions, and the distinction between high and low art collapsed. We bring you 10 artworks created between the years 2000 and 2009 which rightfully represent this innovative era. The best thing is that you can add these works to your collection right now! Featured image: Jef Aerosol – No future (detail), 2003. All images courtesy of their respective galleries. An American contemporary street artist, graphic designer, activist, and illustrator who emerged from the skateboarding scene, Shepard Fairey has been inspiring generations of artists with his thought-provoking and often controversial pieces. An icon of the contemporary art scene in the country and beyond, he is best known for his Obey series, a street art project and an experiment in phenomenology. This Michael Jordan Portrait was created in 2009. 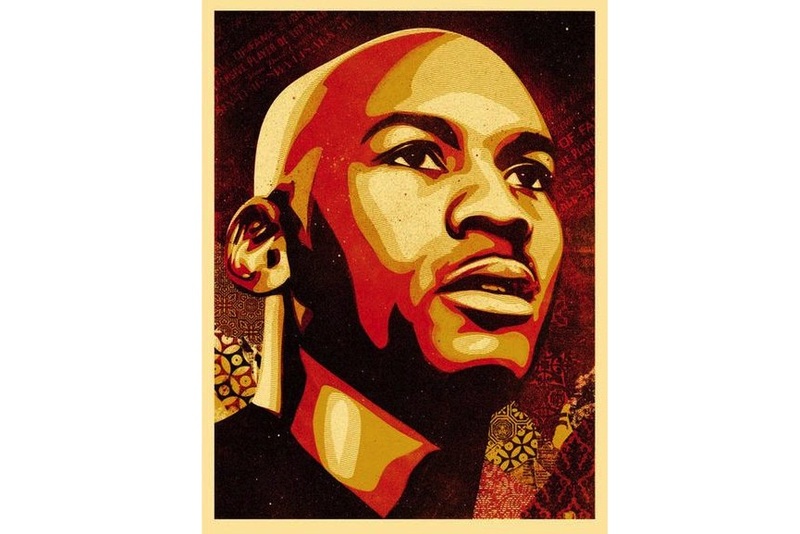 Fairey explained that everything about the acclaimed basketball player is iconic and that his cultural significance makes him a great subject for portraiture. I think it’s that combination of intensity and style, and of course his singular talent, that makes him the embodiment of a legend. For over 50 years, Ed Ruscha has been capturing the shifting emblems of American life, echoing the expansive Western landscape and optimism unique to postwar America. Words and phrases are at the center of his work and first appear in his paintings as early as 1959. Using a range of linguistic devices, Ruscha elevated words to the status of a subject. 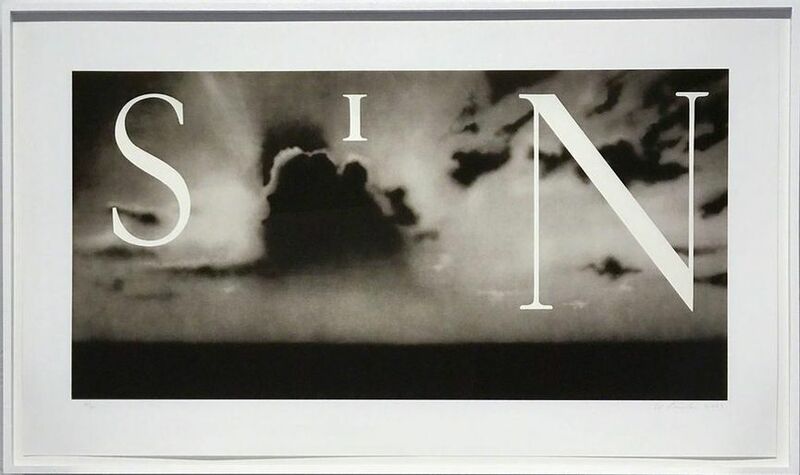 The text in the work Sin / Without is characteristic of Ruscha’s tongue-in-cheek machismo, while the background image suggests themes of detachment and isolation. This work is a critical examination of our culture’s relationship to mechanization and media. A Korean abstract artist, Ahn Hyun-Ju takes an experimental approach in her research of painting techniques and color associations. 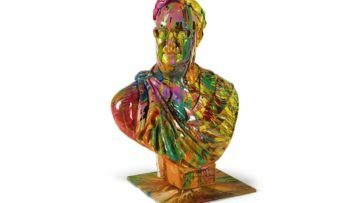 Combining vivid colors with interesting three-dimensional frameworks, the artist creates work which she considers as volume painting. 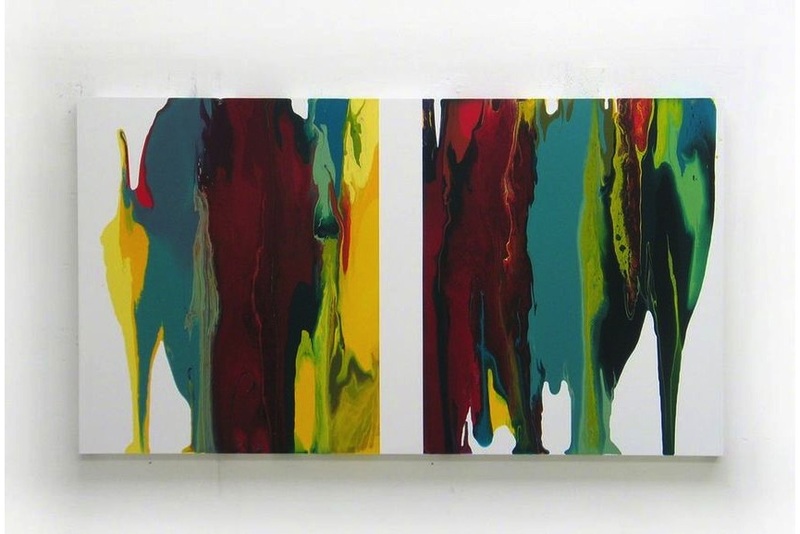 Created in 2009, the work d0709-1 is part of the Dripping series of abstract paintings in which the artist explores the pictorial possibilities of her preferred support – three-dimensional aluminum structures. The work reflects Hyun-Ju’s ample movement. Regarded as a precursor of the British graffiti phenomenon, Nick Walker has influenced generations of street artists. Combining the energy and imagery of graffiti with the mastery of the stencil, he creates pieces that are highly sophisticated and admirable. In 2006, Nick Walker created an alter ego that visits the cities around the world – the Vandal. It is a black suited and bowler-hatted character that allows Walker to declare his independence and freedom from classical street art. This recurring character is also a symbol for the artist’s humoristic expression. A Brooklyn-based artist, Swoon creates life-sized woodblock and cut-paper portraits, using scavenged and local materials. She believes that our bodies and faces store all of our experiences and that a portrait can become a deep insight into those experiences. This work depicts a hijab-wearing woman inspired by her visit to Cairo. All of Swoon’s portraits depict the very essence of her subjects. A United Kingdom-based graffiti artist, political activist, film director, and painter, Banksy still manages to maintain anonymity, creating a mysterious allure to his persona. It seems his spotlight is guaranteed for many years to come. Created in 2004, this work is emblematic of his rebellious street art aesthetic. 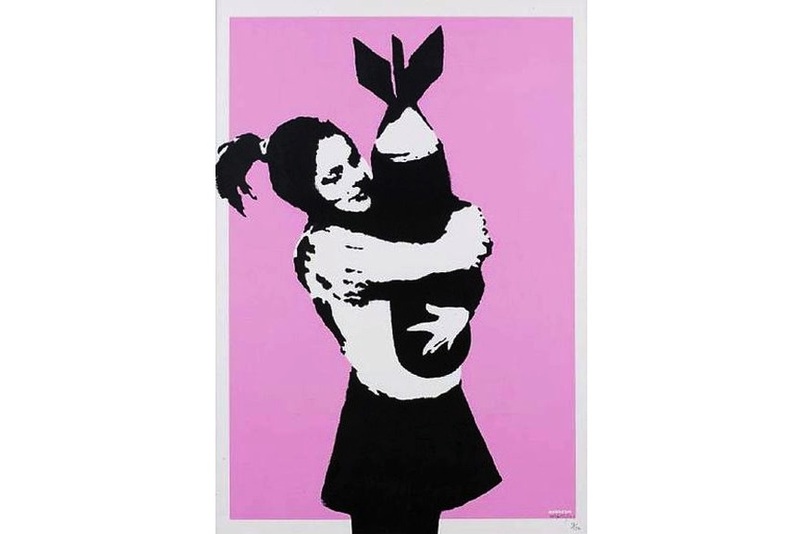 It depicts a ponytail stenciled in black and white hugging a bomb (the type seen dropped from military aircraft) like one might a teddy bear, set against a pink background. It addresses the modern society’s obsession with warfare, with bombs that the governments manufacture like toys. 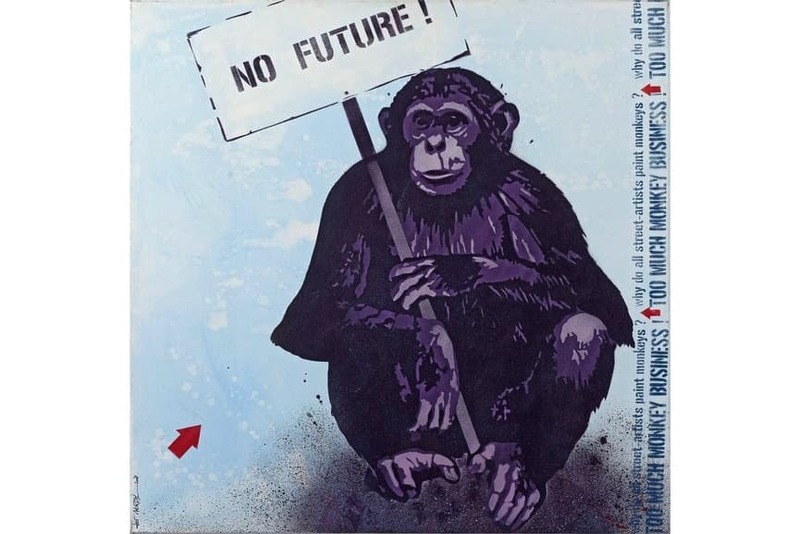 A French urban stencil artist who started working in the 1980s, Jef Aérosol is known as the main proponent of the emergence of the genre in France. He is famous for countless portraits that immortalized both famous people and the ordinary ones. His art is usually adorned with a red arrow, which became the artist’s trademark. 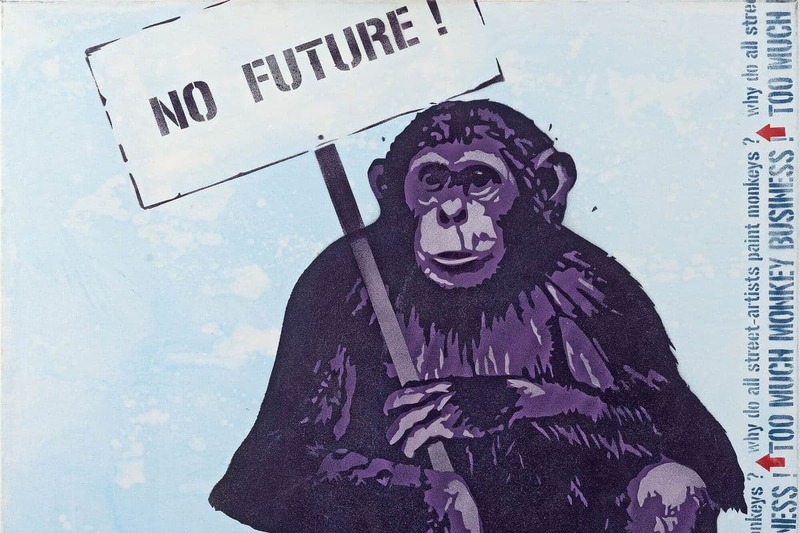 In this piece, Aerosol depicted a chimpanzee holding a “no future” sign, sending a powerful political message. 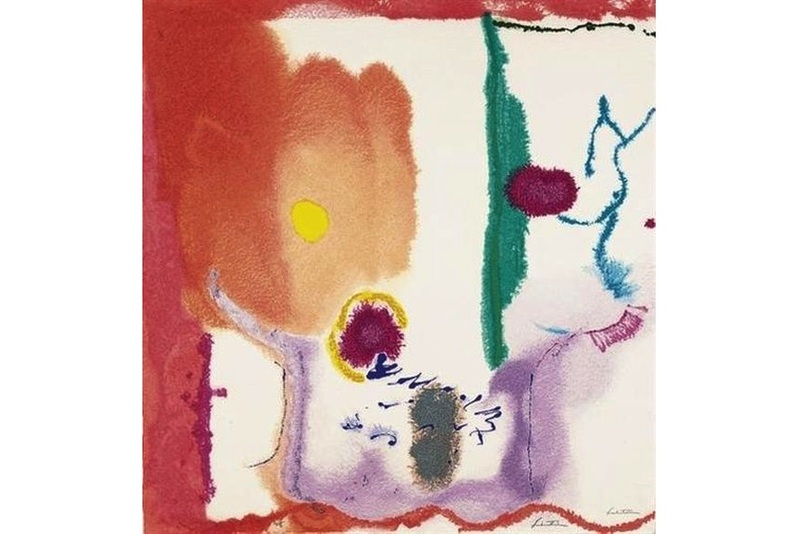 Regarded as one of the most influential artists of the mid-twentieth century, Helen Frankenthaler influenced generations of modern painters with her vital and ever-changing work. Inventing the color-stain technique, in which she poured turpentine-thinned paint onto canvas, she is widely credited for playing a pivotal role in the transition from Abstract Expressionism to Color Field painting. 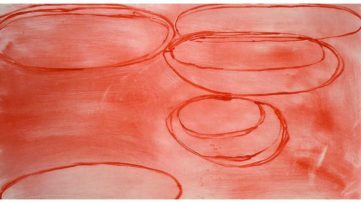 The work Beginnings from 2002 is characterized by her recognizable use of fluid shapes, abstract masses and lyrical gestures were not truly rivaled by any contemporary artist. An abstract painter, writer, curator and teacher, Stephen Maine is famous for his paintings which engage and extend contemporary ideas about color, composition, surface and process. 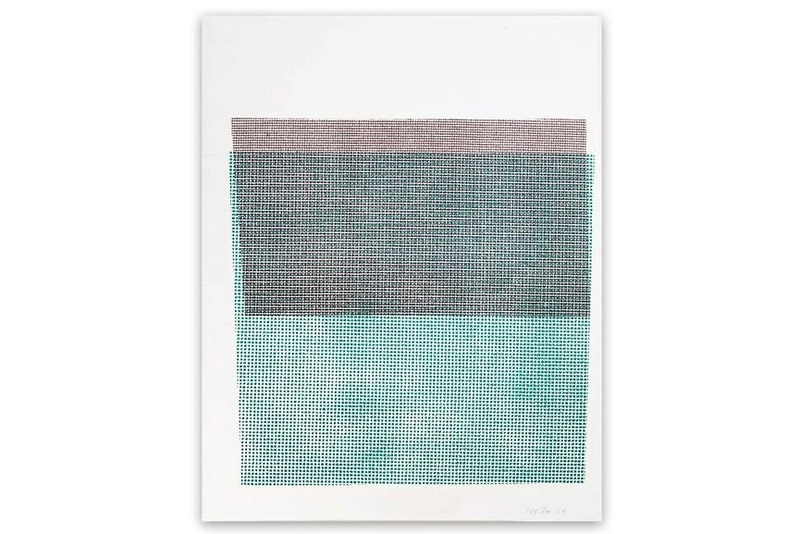 Maine also investigates the potentials and limitations of both the surface of the piece and the process of making it. This work is part of the series Pitched Planes comprised of unique relief prints, made primarily using printing surfaces that are the products of industrial manufacture. 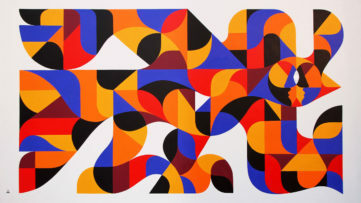 Each shape is made with a different surface, allowing the artist to explore the legibility of the constituent patterns as they are recombined in various layers. A German contemporary artist, Stephen Siebers deals with the laws of gravity and the possibilities of illusion. He creates impossible games of balance between volume and weight that surprise and question the viewer’s expectations. His forms always appear illusionist. 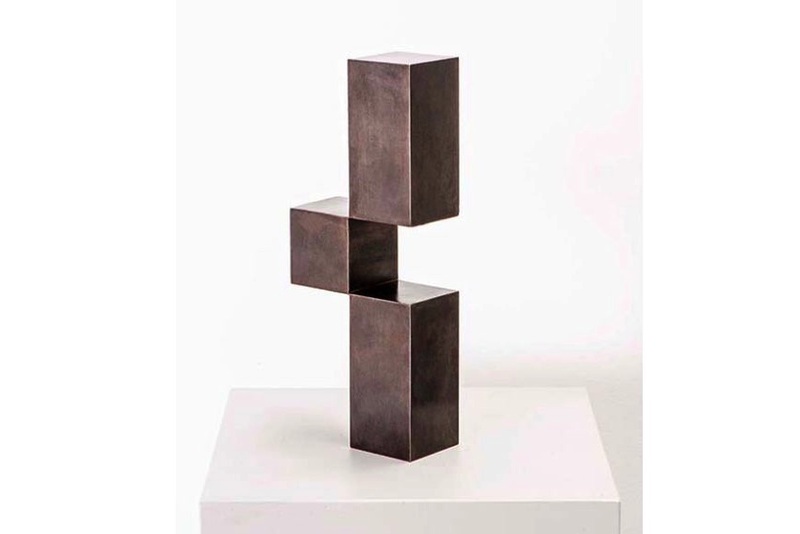 In its simplicity, the work CUBE I from 2009 leaves the heaviness of the material forgotten, and transitory moments are given a lasting form by the defiant indestructibility of the metal.